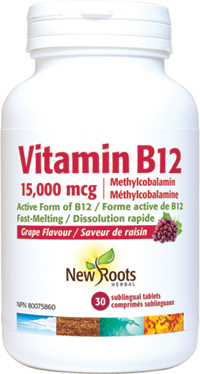 Each fast-acting sublingual tablet delivers 15 mg of vitamin B12 in the bioavailable form of methylcobalamin. Addressing a vitamin B12 deficiency can prove to be a simple intervention with many benefits. Vitamin B12 is instrumental for immune-system performance, DNA synthesis, cellular energy production, and red-blood-cell formation. With such a broad range of biological tasks, it’s easy to consider how supplementation can benefit your health. Sublingual dosage exploits the extremely vascular tissue below the tongue for direct access to the bloodstream, while circumventing the digestive system. Adults: Hold under tongue until dissolved, and then swallow. Take 1 tablet daily with food or as directed by your health-care practitioner. Consult a health-care practitioner for use beyond 2 weeks. Other ingredients: Natural grape flavour, mannitol, xylitol, vegetable magnesium stearate, silicon dioxide, and vegetable stearic acid.